Author's summary: Trish has been sent to Arkham to investigate Patrice, the spectacular violin prodigy who’s a few years past her prime and recently destroyed what remained of her career by having a screaming mental breakdown in the middle of a concert. Patrice retired quickly to Arkham, and Trish has been sent in search of a particular book which is theorized to be in the violinist’s possession. Her contacts told her that she’d know the book on sight—it’s the one bound in shagreen, with hasps of human bone. 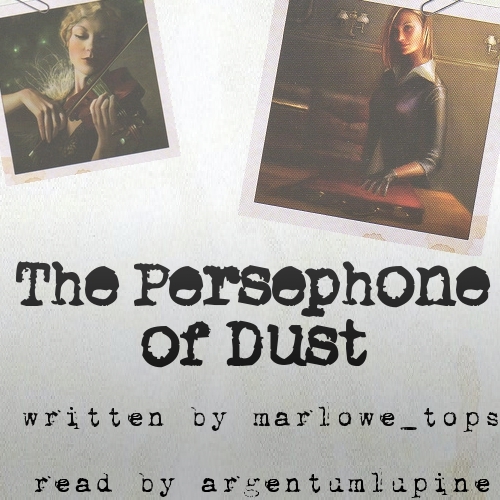 Inspired by The Persephone of Dust by marlowe_tops. Reader's notes at my original journal post here. cover art created by argentumlupine. That's a real nail-biter you created there, argentumlupine! You had me at "The city was old." You sell the magical realism with your mix of matter-of-fact narration style, subtle hints to the supernatural and the effective use of special effects. Beautifully read, and the ending gave me chills.